You’ve definitely found the right area to come fly fishing for Tarpon. The Fort Myers area and Southwest Florida in general have the highest population of Tarpon in the state. The best and most consistent Tarpon fishing available is for our resident Tarpon. 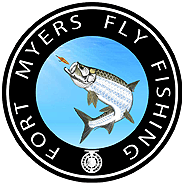 When you’re out on a Fort Myers fly fishing charter with us you will be able to see and cast to actively feeding Tarpon the entire time you are fly fishing. I know of very few places in the world where you will be able to cast a fly to so many Tarpon. We specialize in getting that first Tarpon for all of our fly fishing clients. The best time of the year in Fort Myers to fly fish for Tarpon just happens to overlap with spring break and summer vacations. This is a very busy time of the year for us and we want to make sure that you get the dates you need. Please contact us or you can reserve your charter online using our booking form as soon as you know your dates. The Tarpon will be biting consistently from the first week of April until the end of October so use those dates as a reference when planning your trip. I know I mentioned this earlier but it bears repeating, please be sure you’ve taken the time to practice casting a 9wt fly rod before you come. Unfortunately many of our clients struggle casting during their charter and we don’t want that to happen to you, we want you to be catching Tarpon! Our Tarpon fly fishing charters are always early in the morning from just before first light until about 10 AM on the average. It seems for some strange reason that somewhere around 10 AM the sunlight gets just bright enough to signal the Tarpon that feeding time is over. It’s incredible to be casting to fish and have been active for over four hours and then all of a sudden they just all seem to quit at once. You’ll be casting a 9 or 10 weight fly rod with a floating or sinking line depending upon the water conditions. You should be able to comfortably cast 50 to 60 feet so that you can keep the fly in the strike zone as long as possible. I know I mentioned this earlier but it bears repeating, please be sure you’ve taken the time to practice casting a 9wt or heavier fly rod before you come. Unfortunately many of our clients struggle casting during the first hour which is often the best hour of the day. We don’t want that to happen to you, we want you to be catching Tarpon! If you know you won’t have time to practice, please let us know as soon as possible can so we can schedule you a private casting lesson so you’ll be ready to go when we hit the water for your fly fishing charter.